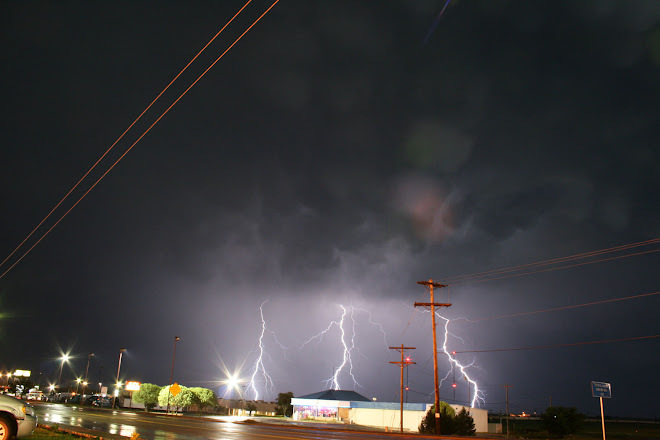 The 3rd of my 12 Favourite Storm Chases goes back to the High Risk of 2011 in Oklahoma. 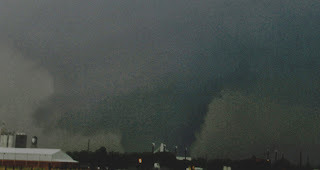 This Outbreak bore a lot of the Hallmarks of the May 3rd 1999 Outbreak in pretty much the same areas and came just 2 days after the devastating EF5 that ravaged Joplin (MO). After finishing a great Chase day in Western Oklahoma on the 23rd we started the Day in Norman with a general target of West of Oklahoma City firmly in the High Risk area and along a developing Dryline. We awoke to cloudy moisture laden skies and strong winds out of the SE, Some of the guys with us were worried about the cloudy weather clearing but already over the Texas Panhandle and Western Oklahoma breaks were allowing Sunny Skies to develop and temperatures out there were climbing into the Mid 80's. It is not often that whole Interstates were preparing to be closed from 2pm that Tuesday afternoon and businesses closed for the day. We left Norman in good time and ate Lunch in El Reno, my target area was from around Enid to Elk City and as we left the Subway the first Storm of the day was going up way off to our South West around Elk City, in 4 radar scans this had an amazing appearance on radar already and started to show signs of rotation. We left the Interstate and headed North towards Canton. Out first Intercept around 245pm had a beautiful Matured Classic Supercell sitting in front of us, strong rotation was noted but it could not get the job done first time around, I noticed on radar this Supercell was already turning hard to the right from it's NNE Course. We loaded the cars up and took a Red dirt road North, we were very close to the FF Core of the Storm so took another Red dirt road East as the clay was starting to get sticky. 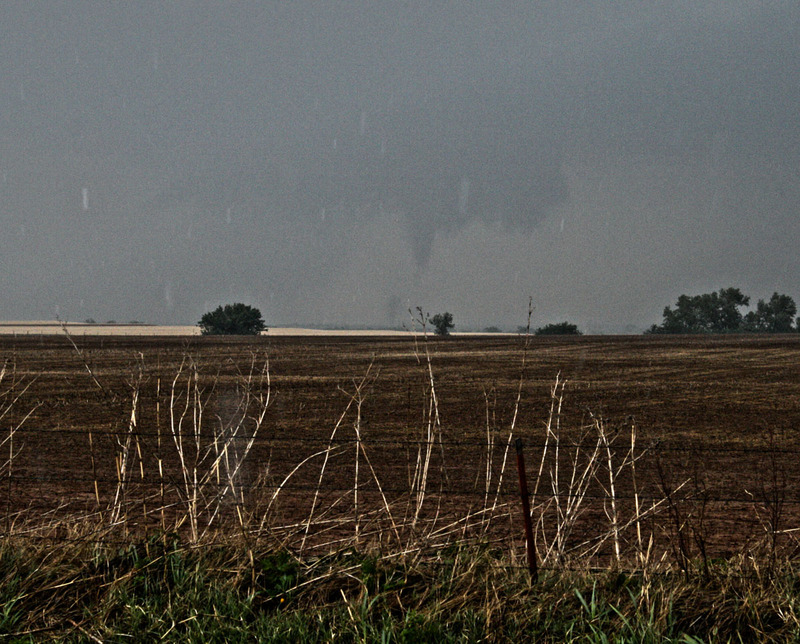 Along this road the first Tornado dropped to our North about 4 miles away, we documented this Cone Tornado for about 5 minutes at 318pm but knew we had to get closer as numerous vortices were dancing around and the next stage would surely become a Wedge. About 1 more mile further East we hit paved roads again and took a North to head straight towards Canton from the South, the next glimpse we got of the Tornado now showed it in front of us as a 3/4 Mile wide Wedge. I approached to be around 2 miles to it's South as it just missed Canton on it's North Side. 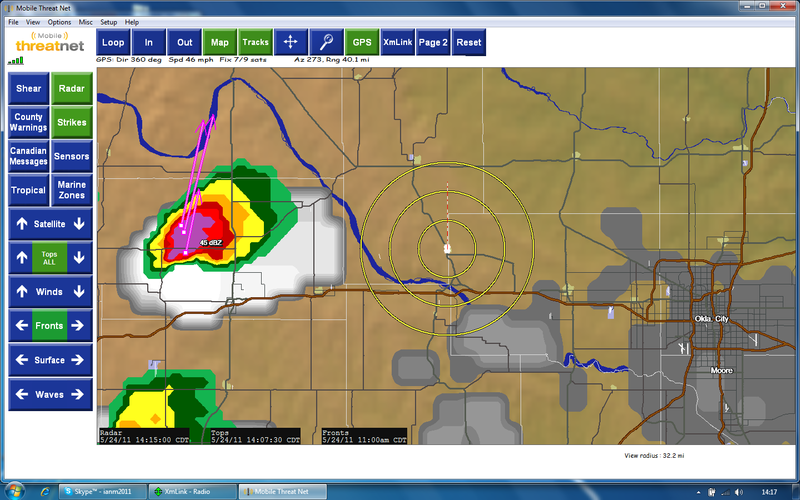 We had a perfect road that ran East and then North East out of Canton to follow this now Eastward moving Supercell. 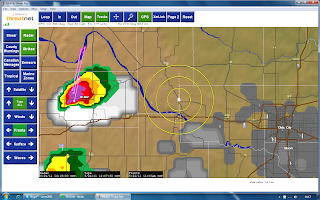 We travelled east and then North East but the Mesocyclone by this stage had occluded. 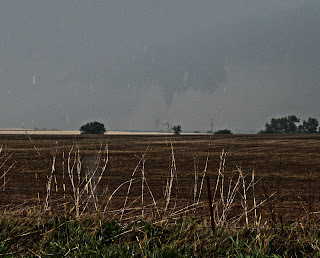 The next town we came to was Fairview, upon approaching Fairview rotation picked up again and a rotating Wall Cloud sitting just to our North West put down a Picture Perfect Elephant Trunk Tornado about 2 Miles to our North West. This was on the ground for about 5-6 minutes and as the Sun hit the lower parts the Tornado took on a beautiful ghostly white colour. At about this time the weather radio was focusing on a beast of a Supercell about 40 miles to our immediate South that would become the El Reno EF5. Our only option was to punch the core of our Tornado Warned Storm and drive east through Enid and try to get back onto I-35 And then head south towards Guthrie to see if we could get an Intercept, but traffic through Enid and Chaser convergence meant the Storm was outpacing us to our South on it's movement East and we would have no time to get in front and try an Intercept. In these types of Situations when Fast moving Tornadic Supercells are heading for the Jungles of Oklahoma it is sometimes best to sit back and evaluate whether it is worth chasing warp speed Storms in dangerous territory especially as most of these storms were dangerous HP Supercells by now. So we stopped the chase quite early for our standards by about 6pm and headed back through the Damage Path back to Norman in readiness for another High Risk day on the 25th much further east over Arkansas and the Mississippi Delta areas. All in all though a great day with 3 documented Oklahoma Tornadoes (The biggest an EF4 @ Canton from a range of about 2 Miles) and was pleased to nail the target and positioning around a very dangerous Storm.